City Centre Al Shindagha is a mid-sized shopping mall home to around 40 stores, a cinema, and numerous places to eat and drink. It is located in Al Shindagha, an old area of Dubai just west of the mouth of the Dubai Creek. Anchor stores at City Centre Al Shindagha are Carrefour, Babyshop, Max, and Splash. VOX Cinemas is a multiplex cinema showing all the latest movies. Another entertainment option here is Magic Planet, a family entertainment centre with arcade games and children’s rides. City Centre Al Shindagha is open every day of the week. Opening hours are Sunday to Wednesday 10 am to 10 pm, and Thursday to Saturday 10 am to midnight. Facilities and services include toilets, baby changing facilities, information desk, and ATMS. The mall is located in Shindagha. Al Ghubaiba Metro Station is just across the road. 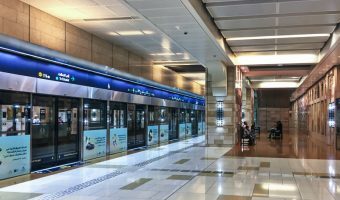 It lies on the Green Line of the Dubai Metro. Al Ghubaiba Bus Station is also within easy walking distance. Map showing location of City Centre Al Shindagha. 7-screen cinema at City Centre Al Shindagha.